The planning process we engage in is not a once in a lifetime event. It is evolutionary, taking into account ongoing changes in your life, your resources and the financial decisions you need to consider. It is customized to your objectives, priorities and values. It is comprehensive and integrated, capable of addressing a wide range of financial circumstances and concerns. With WealthVisionSM, managing your financial life just got easier. Better organized. Accessible. Up-to-date. Adaptable to your changing needs and emerging priorities. The WealthVision platform integrates financial planning and wealth management. It supports our advisory process by providing a powerful engine capable of generating comprehensive financial planning analytics, calculating cash flow projecting and modeling “what-if” scenarios. For our clients, WealthVision delivers an easy to use system to track and manage your balance sheet, investments, and documents in one convenient and secure location. With WealthVision, we bring your financial life together. We can easily access your current information in one place, identify strategies and understand how specific issues relate to your total financial situation. WealthVision is designed to consolidate all of your accounts, assets, and information into one secure personal financial homepage, making your personal life easier. All your information is password protected in a secure, encrypted personal website, accessible only to you and your advisors. Every night, the system automatically updates your balances to reflect the values provided by your financial institutions. Your updated assets are integrated into various reports so that you can monitor their progress in reference to your overall financial objectives. Copies of your private documents, such as wills, trusts, tax returns, deeds to real estate, insurance policies, and beneficiary designations can be uploaded to a secure online depository, safely encrypted but instantly available anywhere an internet connection is available. You can monitor the price fluctuation of your securities through the day and view the latest financial news with snapshots of funds, stocks, and market summary information. You can even collaborate with multiple advisors from different locations at the same time. Russell can give your other trusted advisors, such as lawyers and CPAs, access to designated areas of your personal financial home page, if you desire. 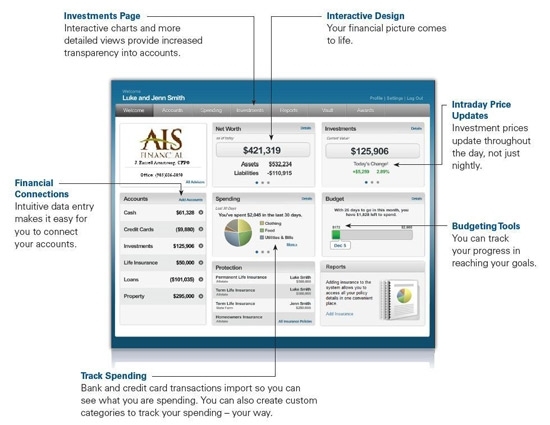 This interactive, collaborative approach focuses the team on your financial future. The system automatically alerts Russell if it detects a problem, like your asset allocation being out of balance or a significant change in your account values. You and your advisors will always be aware of your financial status, no matter where you are.